Chronic drug use can lead to substance addiction. While many people believe that only illegal drugs cause addiction problems, thousands of Americans are addicted to legal substances, such as alcohol and prescription drugs, too. The National Institute on Drug Abuse (NIDA) defines addiction as “a chronic, relapsing brain disease that is characterized by compulsive drug seeking and use, despite harmful consequences.”1 Long-term drug and alcohol use can cause physical and functional changes in the brain that lead to harmful thoughts, emotions, behaviors, and bodily processes. Although most people know the dangers associated with drugs and alcohol, it is not uncommon for a person to feel so overwhelmed with life’s responsibilities that the fleeting benefits of drugs and alcohol seem more important than the risks. This is especially true for individuals in high-powered positions. Alcohol and many other drugs can be a way for a person to self-medicate certain unwanted feelings, such as stress and anxiety. Many people who have busy jobs that demand large amounts of time, intellect, and focus may turn to drugs to deal with stress or to enhance production. Unfortunately, for people in high-powered positions, their career can play a hand in first developing a substance use disorder and, later, prove to be a hindrance to seeking substance abuse treatment. Many working professionals avoid getting help for a drug addiction problem for fear of having to take time off from work or having coworkers or employees find out. However, executive detox programs make it possible to make a positive change in your life without sacrificing your career, and luxury options can make the process much less uncomfortable. Many acute substance withdrawal syndromes consist of several unpleasant and uncomfortable symptoms. Many people who go through withdrawal on their own end up relapsing since returning to drug abuse can alleviate the distressing symptoms. Although it is possible to go through drug detox, withdrawal, and recovery on your own, it may prove far more challenging to do so. Additionally, if an individual is addicted to certain substances—alcohol, benzodiazepines, or barbiturates, for example—they run the risk of experiencing life-threatening withdrawal symptoms, such as seizures. Furthermore, withdrawing from opioids, such as prescription painkillers or heroin, although not fatal, can be extremely painful. In instances such as these, executive detox programs can provide patients with medication that can reduce withdrawal symptoms and alleviate cravings while the drug is eliminated from the body. 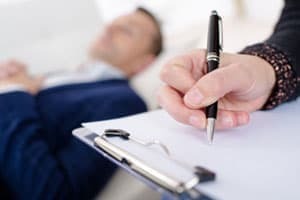 Executive addiction centers, sometimes called executive rehabs or rehabs for business owners, are specialized substance abuse services geared toward the demanding lives of business leaders. Executive rehabs recognize the unique needs of these individuals and create treatment opportunities well-suited to an executive’s lifestyle. Addiction treatment centers that cater to professionals provide high-quality services in a flexible environment that permits time for the person to devote to work. Access to computers, telephones, and conference rooms: Executive detox facilities understand that your career is important to you, so they provide every tool necessary to maintain business as usual while also helping you get healthy. Personalized meals: Healthy, carefully prepared meals offer nutrition your body needs while withdrawing from drugs. Exercise facilities: These allow you to continue or take up a healthy exercise routine while working through your detoxification. Focused attention: Executive detox facilities tend to have fewer patients and often have a higher staff-to-patient ratio, which means you get individualized detox treatment and more one-on-one attention. 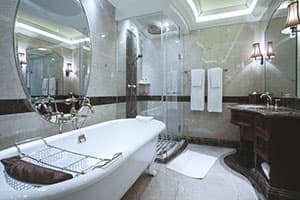 Higher privacy and discretion standards: Executive detox facilities cater to CEOs, celebrities, and other high-powered professionals, so they know that privacy and discretion are of the utmost importance and ensure complete anonymity. Private rooms: Unlike many drug and alcohol detox programs that may require room-sharing or offer dorm-style living, executive detox facilities provide private rooms for each resident. Spa services: Executive detox facilities combat stress by offering upscale spa services, such as massages and facials. Another defining factor of executive addiction treatment is the focus on confidentiality. All substance abuse and mental health service providers are required to maintain the privacy of people in treatment, but this issue becomes more concerning when the patient is a noteworthy figure in the community or the spokesperson for their organization or business. To avoid breaches of confidentiality, executive treatment centers will take precautions to protect the anonymity of their clientele. Offering services at a remote location far removed from busy areas. Transporting clients to and from treatment discretely. Permitting access to the center through inconspicuous entrances and exits. Protecting any records of services. Training all staff to be respectful and professional by not disclosing client information to anyone outside of work. 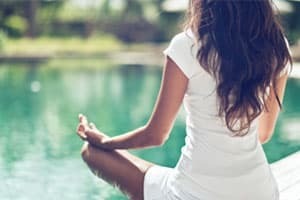 Although executive detox programs tend to be more expensive than standard inpatient or outpatient detox programs due to the wide variety of luxury amenities they offer, it can be worth it to be able to continue working and living your life as close to your usual routine as possible while you recover. Luxury treatment is offered in an upscale inpatient program. During rehab you will live at the facility with others who are in recovery from alcohol and drug abuse. The goal of luxury rehab is to help you break the cycle of addiction while you enjoy the many features of luxury treatment. Even though you will be relaxing in a tranquil setting, you will also be expected to attend meetings and therapy sessions. The comfortable environment and attentive care provided at luxury centers can help you have a more positive experience in treatment. Luxury programs can vary in length with some programs lasting 28 to 90 days or longer. However, depending on your situation most luxury facilities will adjust your treatment schedule if you need to spend a longer or shorter amount of time in the facility. Recovering in a desirable setting does not come cheap. Due to the upscale amenities and services offered, luxury treatment tends to be more expensive than a standard inpatient program. That’s why, in some cases, you can expect to find high-profile clientele filling these centers. Often, the mistaken assumption is that luxury facilities are synonymous with celebrity rehab programs. However, although celebrities may be seeking treatment at some of these facilities, anyone can access luxury treatment if they are able to cover the cost. What Amenities and Services Are Offered? When you go to a luxury treatment center you may feel like you are at an upscale resort, complete with personal chefs, tennis courts, daily massages, and golf courses. Depending on the center, you can expect that your services and amenities will be top-notch. A luxury addiction treatment program is ideal for someone who values comfort while recovering from a drug or alcohol addiction. In addition, these facilities offer an extremely high level of care while also allowing clients to feel like they are relaxing at a luxury resort. Executive and luxury detox programs work hard to make the detox process as comfortable as possible without interrupting your daily life responsibilities. However, it is common to be nervous about not knowing what to expect when you enter an executive detox facility. The addictive substance: Every legal and illicit substance causes different problems after prolonged drug abuse. Your detox experience will depend on which drug or drugs you have been using. The length of drug or alcohol abuse: Over time, drugs and alcohol can cause changes in the brain, which are associated with changes in behavior, emotions, and personality. Depending on how long you have been using specific substances, your withdrawal symptoms could range from mild to severe and could vary in how long they persist. The average dose taken: The dose you have been using will also have a significant effect on how severe or complicated your specific withdrawal syndrome is. Polysubstance use: If you have been using more than one drug simultaneously, you will likely encounter more severe detox and withdrawal symptoms. However, executive detox programs are equipped to help individuals recovering from polysubstance use and can make the detox process more comfortable. Age: A patient’s age is also a significant factor that affects the withdrawal experience. For example, an elderly person may be at risk for more complications than a young person. 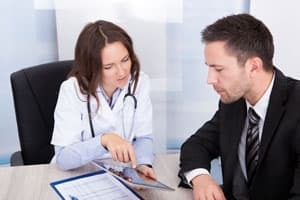 Overall mental and physical health: If you have any mental health or physical conditions, be sure to let your executive detox facility know so they can make every possible accommodation to help you through this difficult time. Each substance presents with its own set of expected withdrawal symptoms, complications, and duration. Depending on the substance(s) you have been using, detox can last anywhere from a few days to several weeks. In a formal detox setting like an executive detox program, the goal is to manage your withdrawal syndrome while the drug is eliminated from your body. These interventions may include medications to alleviate withdrawal symptoms and reduce cravings or assistance through spa treatments, exercise, nutritional adjustments, therapy, and more. Professional detox aims at helping you get through this challenging time and set you up to begin on the road to recovery. The detox process involves ridding the body of the abused substance. This may mean stopping the drug abruptly while taking medications prescribed to manage your symptoms, or following a pre-determined tapering schedule to gradually wean off of the substance. During your stay at an executive detox program, you will receive medical and psychiatric support around the clock and a team of qualified and caring professionals will customize your detox plan to meet your needs. Following the detoxification process, the treatment team will facilitate your transition into an addiction treatment program, which can provide comprehensive treatment and support to promote long-term sobriety. Consuming greater amounts of a substance over time or using the substance for a longer period than intended. Failing to quit using the substance despite efforts to do so. Spending a great deal of time obtaining the substance, using it, or recovering from its effects. Experiencing cravings for or a strong desire to use the substance. Failing to fulfill major responsibilities at work, school, or home due to using the substance. Continuing to use the substance even after experiencing negative effects and consequences. Giving up or reducing important social or occupational activities due to using the substance. Experiencing physical or medical problems due to using the substance. Building up a tolerance to the substance over time, which results in needing to use more of the substance to get the same desired effect. Experiencing withdrawal symptoms as a result of abruptly stopping or reducing use. What accreditations and qualifications do the detox treatment staff members have? Does the program offer medically assisted detox, or is it geared more toward the social detox model? What is the price of the detox program? What type of insurance does the program accept? Does the program offer sliding scale or payment plan options? Does the program offer holistic options like yoga, meditation, acupuncture, art, or music therapy? Does the program have a nutritional or fitness component? Does the program ever have people drop out, and what percentage of patients drop out? Does the program assist with transitioning to a drug addiction treatment program once detox is complete? Does the program create individualized detox plans for patients? Your unique needs, beliefs, lifestyle, and particular addiction will affect which detox is right for you. After you have found one where you feel comfortable, it is crucial that you consider transitioning to a formal addiction treatment program following your detoxification. Formal addiction treatment programs can teach you healthy coping skills, sober social skills, and ways to avoid relapse triggers in order to enhance the recovery process and maintain long-term sobriety. What Does Executive and Luxury Detox Cost? Treatment intensity and duration with more intense, longer services costing more than shorter, less intense ones. Therapeutic community, a longer duration inpatient/residential option, 33 weeks of treatment may cost over $21,000. Adult residential, a shorter-term residential treatment, 13 weeks of treatment typically costs more than $10,000. Executive treatments will represent some of the most expensive options in addiction programs, so you can expect prices to far exceed these averages. Insurance companies may not pay for the entirety of the high costs, requiring a significant out-of-pocket contribution. Additionally, some treatment centers may not accept any insurance coverage. Be sure to check with the drug addiction treatment center and insurance provider for coverage information. Can You Die During Alcohol Detox?